AMobile Intelligent Corp., a joint venture by Arbor, MediaTek, and Konka group, is an expert in industrial mobile computers and solutions, will exhibit Taiwan Excellence awarded product G60, mobile inspection assistant at MWC 2018 in Barcelona (Hall 7 / 7G50) from Feb. 26th to March 1st. 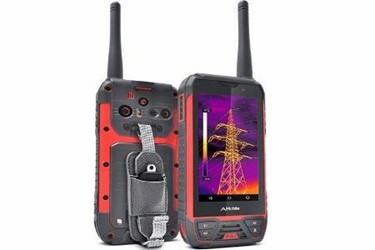 It is the world's first 3-in-one mobile device, integrated with a thermal imager, push-to-talk radio, and smartphone, which is designed for field inspections of building quality, fire and rescue, security and surveillance, transportation, and the electric grid. Other than Taiwan Excellence Award, G60 has also received Reddot Product Design Awards, Good Design Award, Computex d&i, and Best Choice Award. It features not only rich wireless communication but multi-data collectivity, integrating a professional camera, thermal sensors, and radio with a 4G industrial hand-held computer. The ruggedized, compact, and lightweight design is for field operators to easily do inspections. Also, its optional accessories include a high-speed and long-range barcode scanner, a UHF reader, and a laser distance meter for expanded data collectivity and analytics functionality. Besides, AMobile will demonstrate its IIoT mobile devices and solutions which comprise PD-450B with Code barcode engine and UHF RFID pistol grip for medical and retail markets, and GT-500V and GT78-Vthat can be mounted in vehicles for proof of delivery and transportation applications. AMobile, a joint venture by the IPC leader Arbor Technology, the pioneer semiconductor company MediaTek, and Konka group, is an expert in industrial mobile computers and solutions for every industry including Inspection, firefighting, transportation, logistics, warehouse management. Leveraging group resources of manufacturing and services from Konka, IPC know-how and distribution channels from Arbor, mobility technology and support from MediaTek, we are dedicated to being a reliable long-term partnership with our customers around the world through outstanding technologies, sophisticated designs, and superior services, to realize industrial IoT applications. For more information, visit www.amobile-solutions.com.